ET_DC, originally uploaded by Prince of Petworth. In the most anti-climactic news of the week, the Ellwood Thompson deal was finally signed bringing the grocery to the DC USA Complex in Columbia Heights. Don’t get me wrong, I think this is great news. It was simply known for quite a while. I guess I’m a little disappointed because I and a number of local bloggers had recieved an email tip saying “Heads up // big DC culinary news coming this week…”. So I guess I was hoping that a Peter Lugar’s Steakhouse was going to open up in DC. Anyway, I think the drawing looks great. And from what I hear the store will be a great addition to the neighborhood. 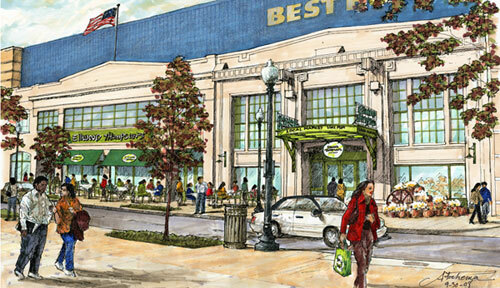 “The local, organic and natural market is slated to open in fall/winter of 2009 and will be nearly 15,000 square feet. In addition, this growth will bring 90-110 new jobs to the area, everything from managerial to general positions, with great benefits and a unique and meaningful working environment. So I guess the question is will you shop at Harris Teeter in Adams Morgan, the Giant on Park Road or the upcoming Ellwood Thompson’s?